One of the most critical elements that can impact the effectiveness of your ebook is its visual representation. If it's formatted poorly and looks unprofessionally prepared, it makes you look poor and unprofessional. The old saying "you can't judge a book by it's cover" may be true, but the reality is that great covers and titles capture people's attention and makes them want to download your ebook. Investing time and resources in creating in a good graphical representation of your content is critical. 1. Maintain brand consistency: If every one of your ebook covers looks completely different, people will not easily associate them with your company. Ebooks can have their own uniqueness, but it's important to maintain some graphical consistency across all online platforms. You want someone to know it's your content by the look and feel, even if they don't see your logo or company name. 2. Create compelling titles and themes: (I could talk for days about this!) The title and theme go hand-in-hand. Together, they should be compelling enough to make someone want to "open the book". 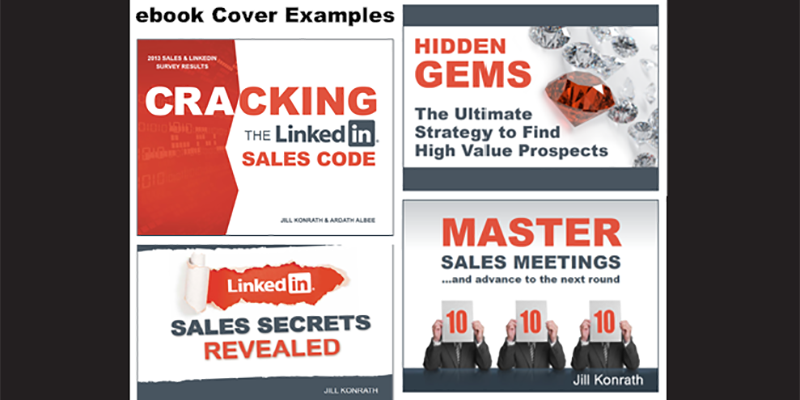 Cracking the LinkedIn Sales Code: cover has a crack and the code is in orange. LinkedIn Sales Secrets Revealed: "LinkedIn" is being revealed, and we use the tear concept for the lines at the top and bottom of the graphic. Hidden Gems: the gems represent high value prospects. Master Sales Meetings: by receiving a high score you move on in the competition for business. 3. Lead generation strategies: Every ebook (or other types of content offers) should include lead generation strategies. At Moon Marketing, we focus on developing ways to encourage the reader to share the content with their own audience. We also strive to put in calls-to-actions that move prospects through the buyer journey. 4. Promotion: Developing a good content offer is an investment you don't want to waste. We continue to promote them for our clients using social media, email marketing, or other marketing campaigns to consistently drive new people to the website. The value? Over 28,000 people have downloaded Cracking the LinkedIn Sales Code and Sales Secrets Revealed this year alone. We did one dedicated email blast for Hidde Gems and 1477 people downloaded the ebook. On top of that, all of these ebooks have over a 50% conversion rate!